Town Hall, Westoe Road, South Shields. In foyer on left wall. Plaque 30 inches high x 44.5 inches wide (762 mm x 1.06 m). The lettering is incised and painted blue using Roman capitals. N.A.L.G.O. 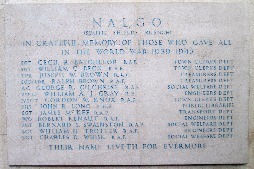 / (South Shields Branch) / In grateful memory of those who gave all / in the World War 1939-1945. 13 names, ranks, regiments and public department. in the World    War 1939-1945. Sgt. Cecil R. Batchelor   R.A.F. Town Clerks Dept. Sgt. William C. Beck   R.A.F. Town Clerks Dept. Tpr. Joseph W. Brown   R.A.C. Treasurers Dept. Sqd/Ldr. Ralph Brown   R.A.F. Treasurers Dept. A.C.     George R. Gilchrist   R.A.F. Social Welfare Dept. 2nd Lt.  William A.J. Gray   R.E. Engineers Dept. F/Sgt. Gordon W. Knox   R.A.F. Town Clerks Dept. Sgt. James McKee   R.A.F. Transport Dept. W/O      Robert Renaut   R.A.F. Engineers Dept. Sgt. Bernard S. Swainston   R.A.F. Social Welfare Dept. Sgt. William H. Trotter   R.A.F. Engineers Dept. Sgt. Charles R. Whisk   R.A.F. Social Welfare Dept.